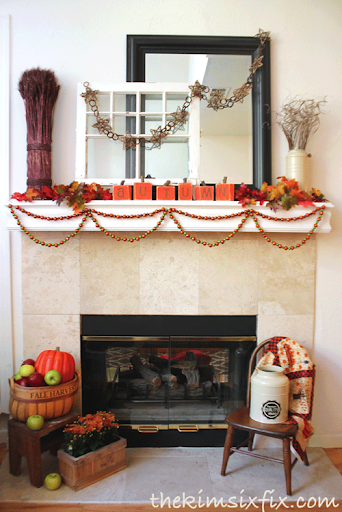 Over the weekend I finally got inspired to put up my autumn mantel. I still have the back-to-school version up in the playroom, but in the formal living room it was time for fall. I found this great grapevine star garland on clearance after christmas last year. Of course, I needed to use my scrap wood bock pumpkins.. I still love them so much! Fake fruit in a basket is one of the few ‘kid friendly’ things I could leave on the hearth. The kids have been playing ‘farmers market’ with the apples and carry them around the house. Pretty funny. The matching one is also included on the mantel itself: The swag garland is made from vase filler that I strung on a thread. Nothing too complicated. Even though it is still in the mid 90s here, and not a single colorful tree can be found, it is still feeling a lot like fall in the house.